We saw thousands, and perhaps tens of thousands, of birds as we cruised Yellow Water. There is an incredible concentration of birdlife at this wetland site, and I was nearly beside myself with delight (and frantic to write down everything we were seeing). It wasn’t just numbers of each species, though that was impressive, but the diversity of species, as well. Ibis, sea eagles, ducks, pygmy geese, lotus birds, and vastly more surrounded us, flew or perched overhead, or hunted in the water nearby. 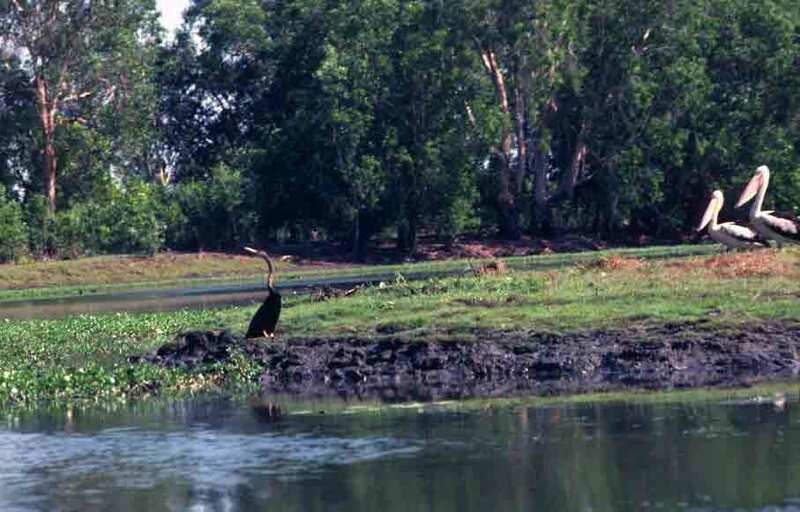 Among those hunters were several snakebirds, which are also called darters, and in some parts of the world are known as anhingas. Snakebirds are found in tropical to warm temperate regions worldwide, with the exception of Europe. I have since seen anhingas in Florida, while down there photographing birds during the spring mating season, but my first view of this lithe bird was at Yellow Water. The bird gets its “snakebird” moniker from the way it hunts. It swims almost completely submerged, with only its head and long, flexible neck above the water. As it swims, the head and neck dart from side to side, darting snakelike as it looks for fish. (And that darting is, of course, why it is also sometimes called a darter.) When it sees a fish, the snakebird strikes with the speed of a snake, too, spearing the fish on its bill. It then carries the fish to shore for consumption. Once fed, it perches on a branch and spreads out its wings to dry them. The darter below is being watched by a couple of Australian pelicans—which were also abundant at Yellow Water. If you saw the movie The Rescuers Down Under, then you may remember that the villan, Percival McLeach (voice of George C. Scott) had a pet lizard he called Joanna. This would make anyone familiar with the Australian lizards called goannas smile (as opposed to story elements, such as a young boy walking from Ayres Rock to Kakadu by lunchtime, which would make them groan or guffaw). On the other end of the scale, there are pygmy goannas that only grow to about 8 inches. The goannas that one most commonly sees, however, are from 2 to 4 feet in length—not giants, but still impressive. Goannas (along with other monitor lizards) are carnivorous. Like most other carnivores, they have sharp teeth and claws. They are swift and clever hunters, and research seems to indicate a high level of intelligence, at least for a lizard. 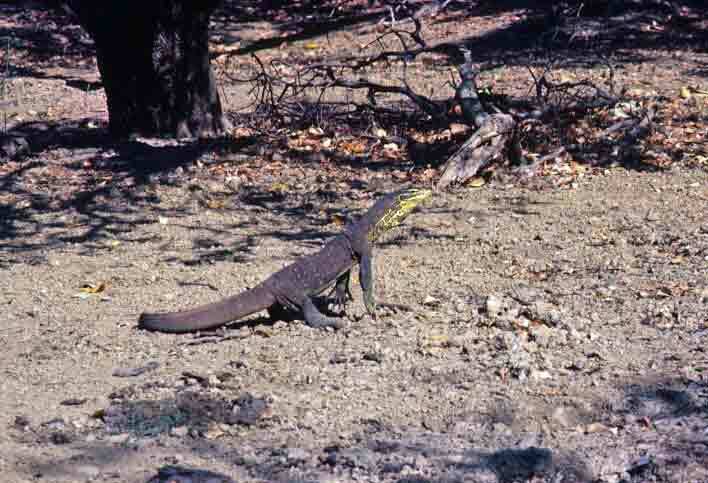 During my several trips to Australia, I have seen a fair number of goannas of varying species, but the first one I saw live was during my visit to Kakadu, when we stopped briefly during our cruise at Yellow Water to watch a monitor making his way across a clearing near shore. This was no giant, but at roughly four feet in length, he still commanded respect. You can see that he is on the alert, because, despite our tip-toeing, he knew we were approaching. Our second day in Kakadu National Park, we had an early-morning cruise on the beautiful Yellow Water Lagoon (sometimes also called Yellow Water Wetlands). The lagoon is named for the yellow water lilies that cover the surface of the water in the spring. We were a little early for the yellow flowers, but we were delighted by the astonishing bird life that is the real reason folks come to this wetland area. I also thought the saltwater lagoon itself to be remarkably beautiful. 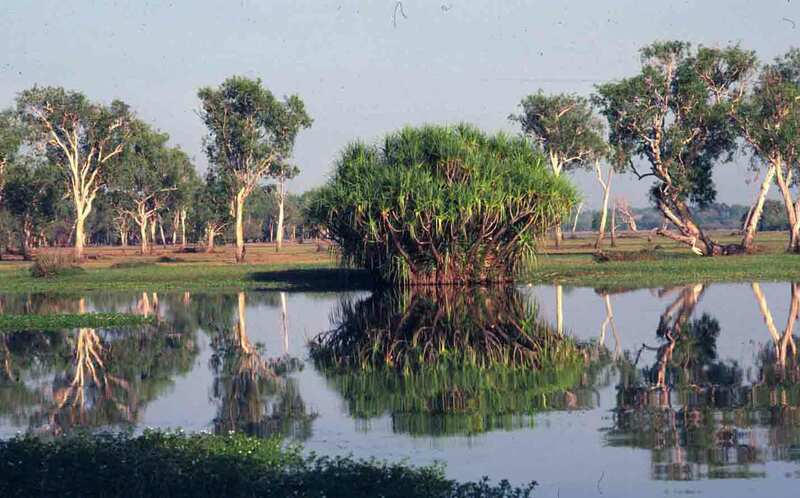 In the photo below, the glassy water reflects a large clump of pandanus and the surrounding pale-trunked paperbark trees that are common around waterholes in Kakadu. In the family Accipitridae, which includes eagles, buzzards, and harriers, kites are the mid-sized models. There are numerous species of kites, divided among three subfamilies, which live in warm (temperate as well as tropical) regions worldwide. Like other daylight raptors, kites generally rely on speed to dine. That said, some kites eat nothing but snails, so they must not all be relying on speed. One species of Australian kite eats rabbits, lizards, and emu eggs. Some live on insects, and are particularly happy when a brush fire leaves the ground littered with lightly charred grasshoppers. Many are primarily scavengers, though they’ll fill in with rodents and reptiles when there’s nothing to scavenge. 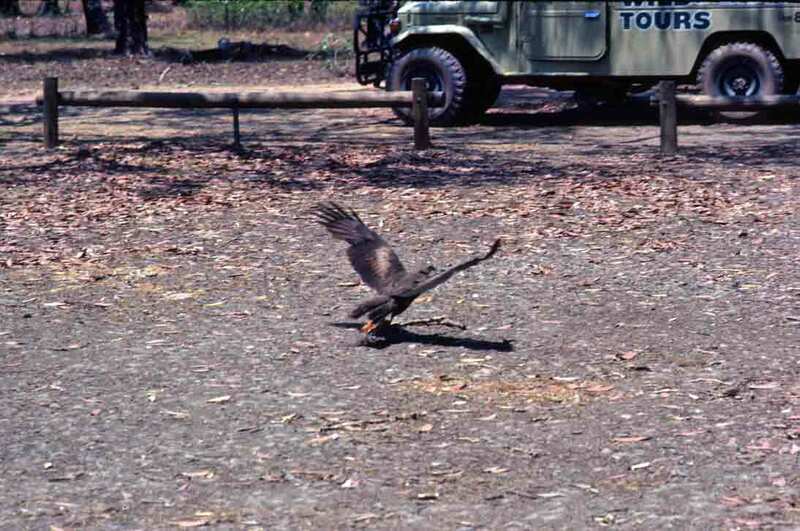 It seemed pretty clear to us, even without much expertise in ornithology, that the kites attracted to our camp in Kakadu were the kind that lived by scavenging. Either that, or they had been well trained by tourists like us. Whenever we cooked a meal during daylight hours, they were on hand, waiting for the leftovers. Our guide, Henk, showed us a trick for photographing these speeding raptors as they dove in to pick up a snack. First, he placed a stick on the ground and told us to focus on the stick. He then tossed meat right next to the stick, with the instruction that we just fire off a shot when he said “now.” Of course, he had to say “now” just before the kites actually reached the meat, because even swift reflexes wouldn’t catch the grab if we waited until the birds were in our viewfinders. But with a couple of tries, we all came away with at least recognizable images of the lunchtime cleanup crew at work. Plumeria is almost unavoidable in Hawaii, as its intensely fragrant blossoms are popular for making leis. 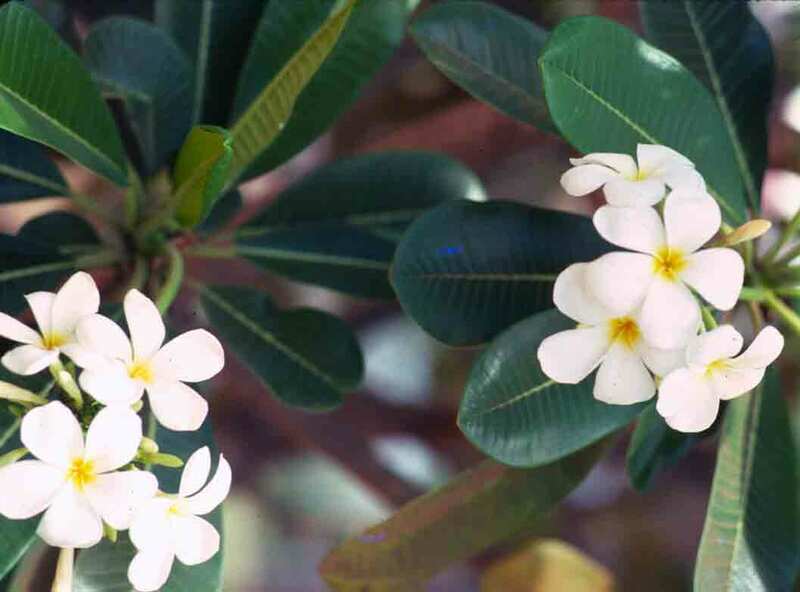 Australians don’t make leis, but they do have a considerable amount of plumeria (or frangipani) growing in the country’s tropical and subtropical regions. Frangipani (gotta pick one name, and since this blog is about Australia, I’ll use the Aussie moniker) is related to Oleander. Because once the flowers die, the plant presents clumps of thick, bare, finger-length twigs to the viewer, an alternative name in Oz is “dead man’s fingers.” Not a really lovely name, but I’ve seen the trees bare, and the name is apt. Flowers range from white to yellow to deep pink. The flowers are more fragrant at night, but there is no time they are not a delight. Crowds of frangipani trees bathed our first campsite in Kakadu in their heady perfume. What a joy. If you saw the movie Crocodile Dundee, you might recognize the shot below. In the movie, it is where Mick Dundee and Sue spend their first night in the wilderness—or to be more precise, it’s where we see them preparing to face the day after they spend their first night in the wilderness. Needless to say, having been there myself, I was delighted to see it in the movie. The large rock outcrop in the background is Nourlangie Rock. Nourlangie is the site of important Aboriginal rock-art “galleries,” and we were there, on my first day in Kakadu, to view generations of fascinating paintings. It is estimated that Aboriginal people have been using this site for around 20,000 years. The entire area is archaeologically important, as it is believed that this is where the earliest tropical settlement of Australia occurred. The people in this area developed grinding stones for crushing seeds and later used the grinding stones to crush ochre for painting. At Nourlangie, we saw rows of “bowls” ground into the stone from centuries of artists crushing their pigment. 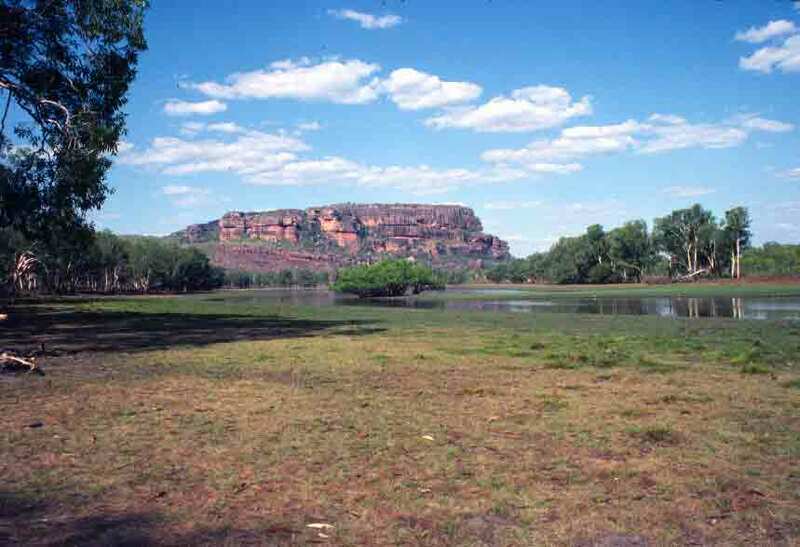 Nourlangie Rock and surrounding early art sites are among the reasons Kakadu National Park was made a World Heritage Site. The richness of the ecosystems here is another reason for protecting the area.